It's almost time for Halloween; are you busy stitching Halloween projects? October 31 has become the second most popular stitching holiday after Christmas, meaning there are designs galore out there to help you decorate in style. The best part is that it gives you a good reason to use fibers with special effects. Yes, this is the Glow-In-The-Dark Holiday. Have fun with it. Do your Halloween project have a night sky? Here's an idea for customizing some of the night scenes in cross stitch, embroidery or needlepoint designs: add Kreinik glow-in-the-dark thread to add spooky yet fun effects Watch the video above as we demonstrate on a fabulous Pepperberry Designs needlepoint canvas. Glow-in-the-dark threads are fun all year, but they're must-haves for Halloween stitching. Make eyes glow (cat eyes, bats, jack o'lanterns, etc), use it to write subliminal messages in areas, outline spider webs, and more. Kreinik off-white color 052F Grapefruit in particular blends perfectly into moons, stars, clouds, and ghosts. 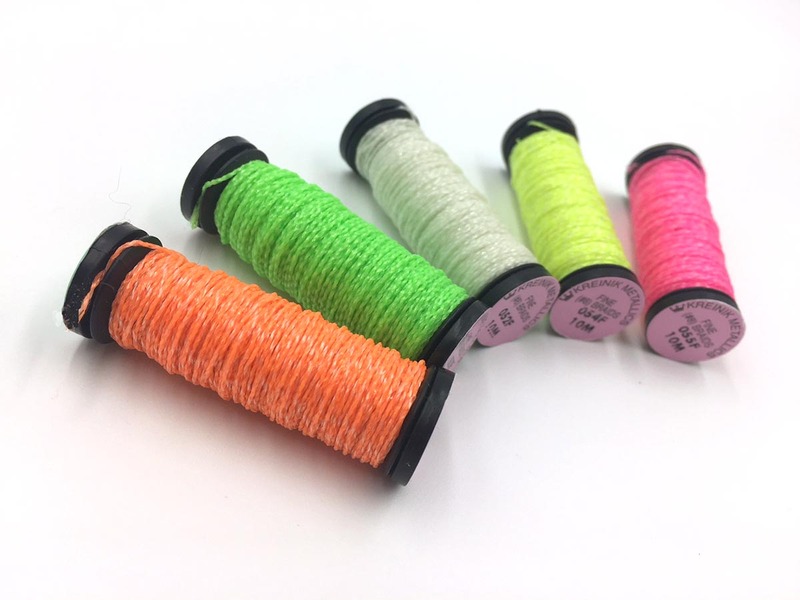 Look for Kreinik colors that have an "F" in the color number, which represents fluorescent or glow-in-the-dark colors. It really is that simple. That's the secret to making a memorable, unique, fun and fabulous design that everyone will love. Watch the video above as we share some ideas for using glow-in-the-dark thread (and even some metallics for added effects), featuring this Pepperberry Designs needlepoint canvas. You can use these ideas anywhere, whether you're cross stitching, needlepointing, anything. Stitching for events like Christmas, winter decor, wedding gifts, Mother's Day mementos, and such call for classic elements, but Halloween...Halloween is the holiday for letting your hair down, kicking up your heels, popping some punch and having a blast with your needlework materials and designs. Specialty threads are all about special effects. Use metallics to add shimmer and "movement." Use glow-in-the-dark threads to add light and hidden messages/elements. Use real metal threads to add shine and dimension. You get the idea...have fun!